I am soooo in love with these! I have a long way to go in terms of lingerie knowledge and sewing but I am so happy with these. After adjusting the pattern I used for last week’s knickers, these are far more flattering and comfortable for my size. I have used a pale champagne tulle and hand embroidered black polka dots all over, finishing off with spotty black tulle bows to the side. Half way through I really was debating the wisdom of sewing so many dots (I can’t believe how long it took) but, now it’s finished I am really glad I did. Somehow they make them feel more special. I can’t tell you how exciting it is to have made these. It feels like a big step towards what I want to make – comfortable, flattering plus size lingerie which also feels luxurious and gorgeous. 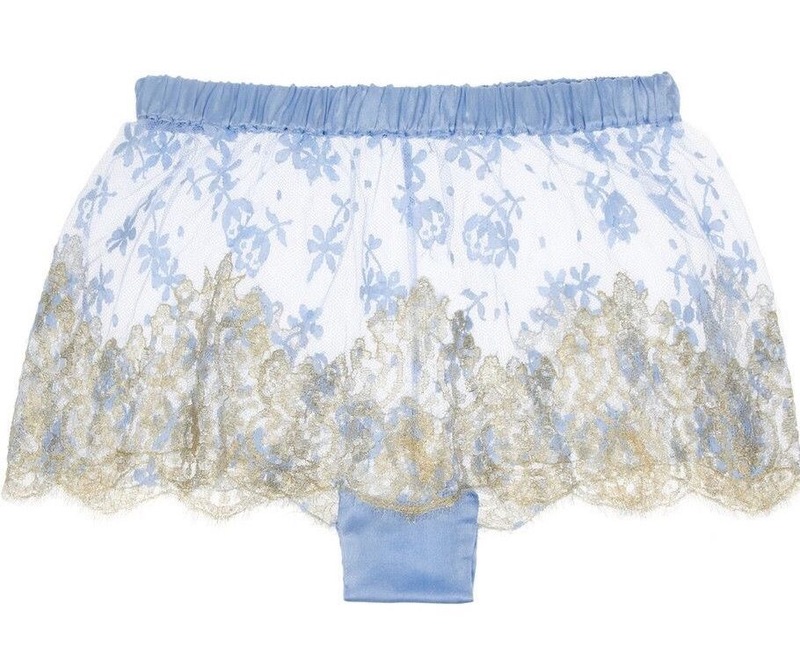 I appreciate that I have got a huge way to go in skill and knowledge and I definitely need to source some better quality material but somehow these knickers make me feel like it is possible. I think somehow, I had a little voice saying that I can’t find lingerie like this in my size because it is impossible that it would look good. But these do look good, the bows at the side make me look curvier (in a good way which makes my waist seem smaller), the frills on the edges soften the edges which helps my tummy and although transparent the overall look is feminine rather than trashy. You might be able to tell… I’ve been doing happy knicker dances all weekend. Seriously, how cute are these? I’ve been hearing good things about Leg Avenue’s plus size range and have been meaning to try them, for a while now. I bought these from eBay but stockingshq.com sell Leg Avenue as well. Leg Avenue describe their plus size range as ‘Queen Size’ which personally I find a little cringeworthy but can forgive since at least they are trying and it is a thousand times better than xl, xxl, xxxl etc. I found these extremely stretchy with a good size band, although I’m not sure how much bigger the band itself would stretch so might dig in on a bigger size. (If anyone does have experience of wearing these please do share in the comments). 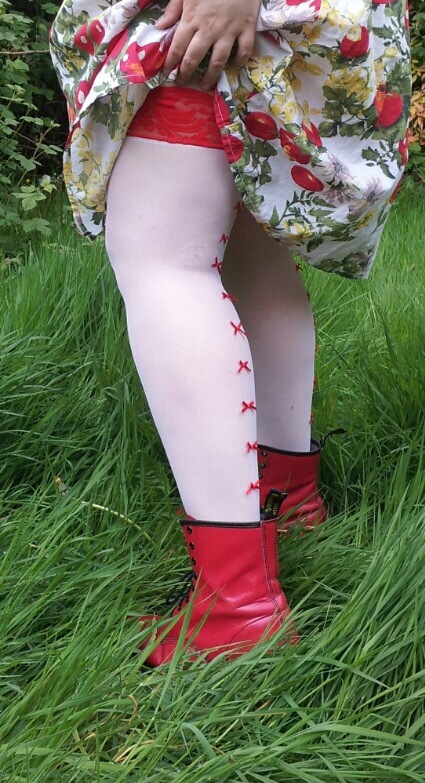 Generally, I am not so keen on white hosiery but I love the bows down the back. Once you get past the ‘bedroom’ connotations it is easy to see how these would work for a quirky, feminine, daytime look. I’m looking forward to pairing these with summer dresses and Docs when it warms up. Description: sheer white with red lacy tops and red bows down the back of the legs. I haven’t been able to go bare legged under skirts since my teens. It’s one of the reasons I don’t necessarily look forward to summer. So, when I saw this post by Fuller Figure, Fuller Bust I was really quite excited. I’ve never subscribed to the idea of wearing shorts under skirts to prevent thigh rub so in recent years have resigned myself to wearing leggings under skirts or sweltering in jeans. Last Saturday then I ordered 2 pairs of Mish’s anti-chafing bands – charmingly called ‘Bandelettes’ – 1 plain and 1 lacy pair. They do a range of sizes, all you need to do is measure your thigh and pick the corresponding size from their list. These arrived yesterday, so I have been road testing them since. They have a thin silicon band at the top and bottom and are made using a stretchy fabric. I found the lacy ones a bit too scratchy for me (I struggle with most lace top stockings for this reason though, so not unexpected). The unisex version however were great – really comfortable, no problems staying up and I think they look pretty good too. I definitely intend to buy more of these before the summer. It is really exciting to think that this year I might be able to keep cool and my poor, pale, pasty legs stand a chance of finally seeing some daylight! The blue pair even features a how-to-sew on her blog so I definitely want to try that out! Two weeks ago I would have said that ‘knicker elastic’ was surely a basic thing which would be easy to buy. I naively went shopping with the vague ambition of buying some ‘fabric and stuff’ to make a pair of pants, without really researching what I might need. I think I assumed I would reach the store and there would be packs labelled specifically ‘knicker elastic’. As is blatantly obvious, I was wrong. The first store I visited (a general craft store to be fair) did have elastic, but only white bands. 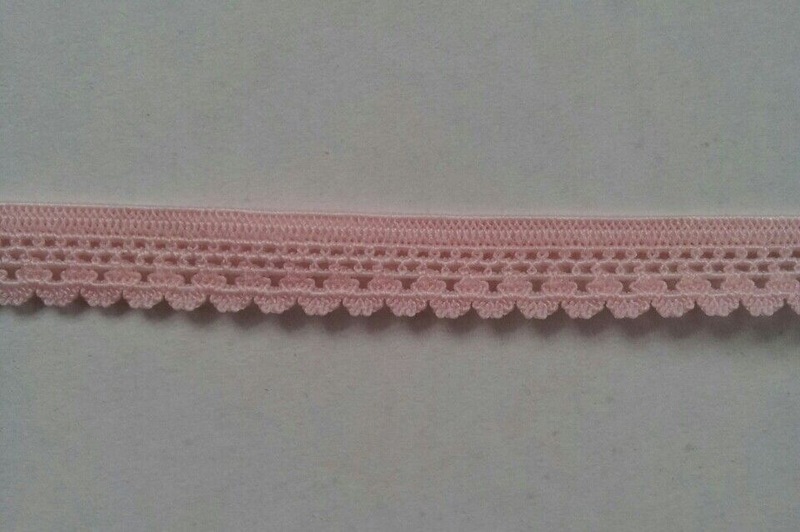 Not being sure what type I would really need to make my knickers and being unwilling to go check my current pair in the loos, I hedged my bets and bought elastic shim (still no idea what this is for or why I thought it would be a good option) and also bought this white band. 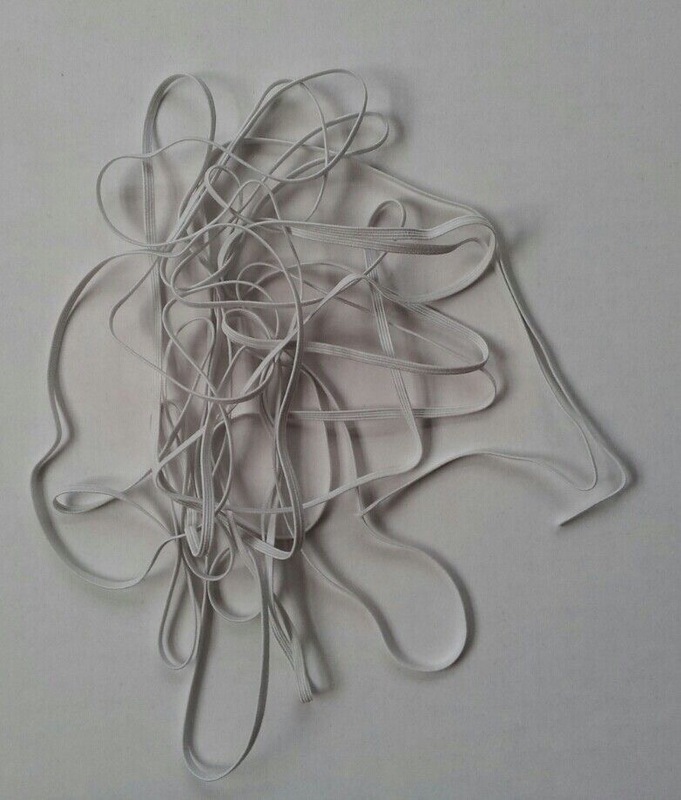 On returning home I used this elastic to make my first disastrous pair which you can see in an earlier post. Upon inspecting my knicker drawer I realised most used a fancier elastic with a frilly edge. Ok, I thought, maybe this is proper knicker elastic. I probably need a proper sewing shop. So I dutifully went to my local specialist shop to be faced with the same wall of boring plain white and black elastics. I asked the assistant for help and although she seemed a bit confused by my request, we did eventually find a solitary metre of what I was looking for on a roll at the back. 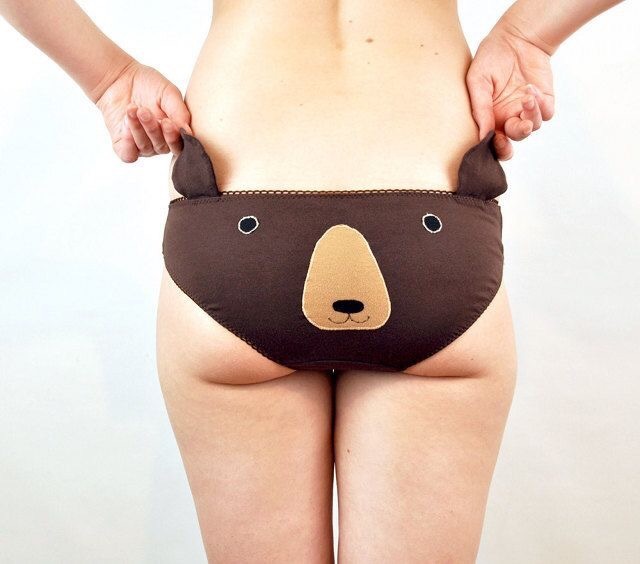 This worked much better for my next pair of knickers but still left me with the problem of where to buy more. Enter my old friend eBay. Searching knicker elastic did not illicit many results but decorative and lingerie elastic gave me enough results to realise that I was actually looking for ‘picot’ elastic. 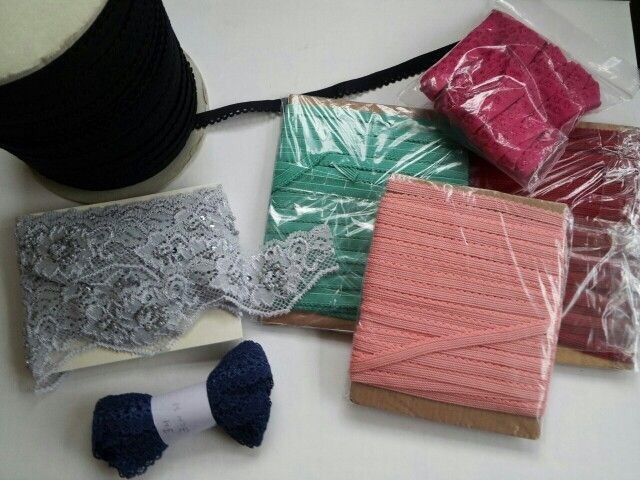 And then I went on an elastic shopping spree. This should really keep me going for a while but I would like to find a range of more unusual colours and decorative patterns so if anyone does know a good source, please do let me know! In my quest to figure out how to make beautiful underwear for plus size ladies I realised I need some help! I have bought the book ‘The Secrets of Sewing Lingerie’ by Katherine Sheers & Laura Stanford. I am now working through some of the projects. The patterns go up to a UK size 18 (although judging by the measurements also provided these are small sizes) so I’m making the biggest and then going to work on adjusting the patterns to be more comfortable for me. These are from the ‘Forget me Knot’ pattern using tulle. 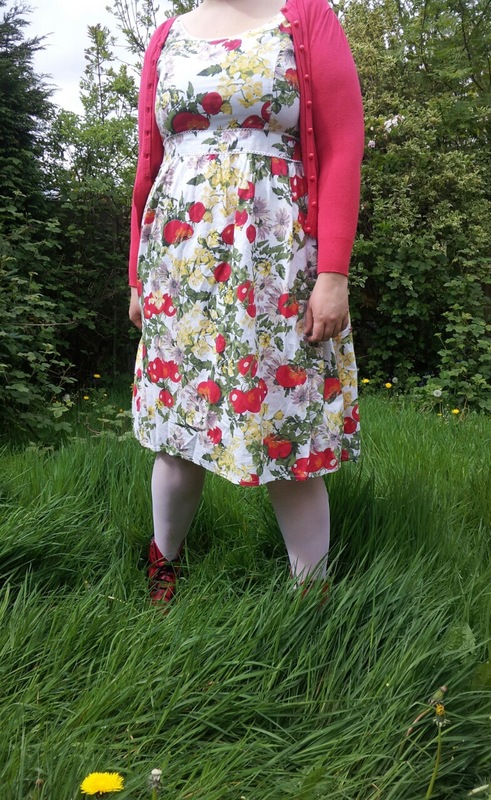 Most of the sizing has worked out ok, but to be more comfortable for a larger size I need to adjust the pattern to widen and lengthen the gusset and also the sides are far too narrow, too skimpy to look good. Look out for the improved plus size version next week!